Arridge Garage Doors are the ideal choice for garage doors in Wrexham and North Wales. Located just a short distance from Wrexham in nearby Oswestry, we have been proudly serving the North Wales area for over three decades. As well as Wrexham itself, we cover all of the surrounding areas including Gwersyllt, Brymbo, Coedpoeth, Bradley, Llay, Gresford, Ruabon, Rosset, Holt, Chester, Mold and Chirk. 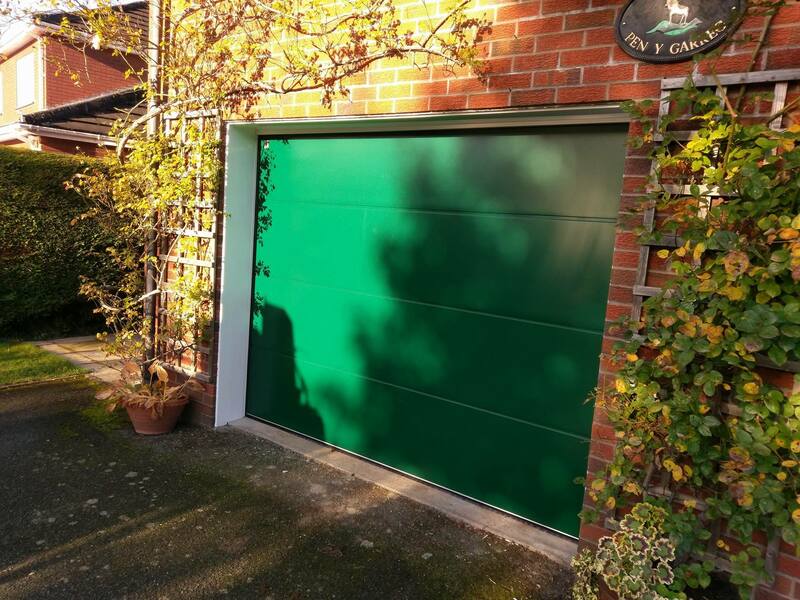 We also regularly supply, fit, repair and automate garage doors in Llangollen, Overton, Rossett, Caergwrle and Marchwiel. We sell and advise on an unrivalled range of quality garage doors from leading manufacturers, in a range of styles that are suitable for every property. As well as a full range of standard sizes, we have a wide choice of made to measure options for complete flexibility. All doors are heavily discounted off manufacturers list prices. We discount, supply and install all the leading brands including Hormann, Garador, Aluroll, Alutech, Carteck, Woodrite, Ryterna and Cardale. Please scroll down the page for more photos of local installations and our customer reviews. Our installation of Ryterna Traditional insulated side-hinged in Irish Oak finish in Penycae near Wrexham. Installation service in Wrexham and North Wales. 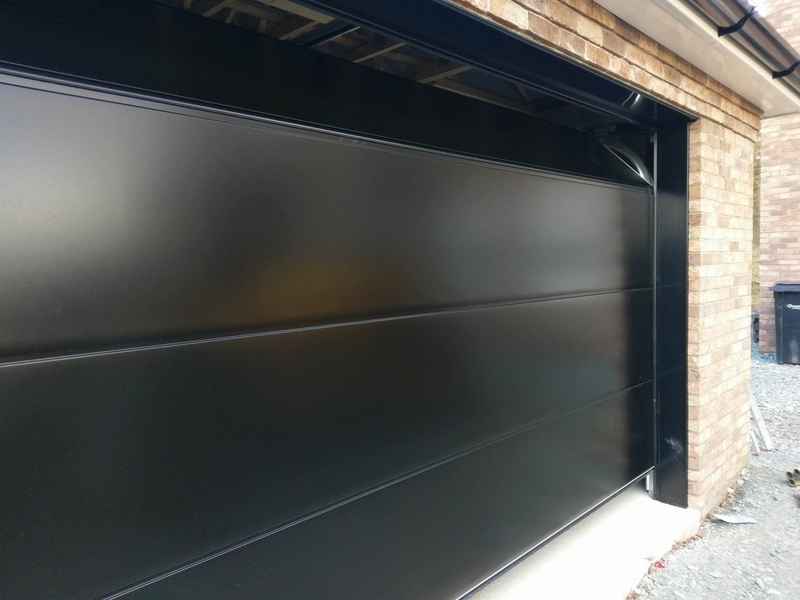 We offer a complete service in the Wrexham area including supply and installation of all types of manual and electric garage doors, garage doors repair and garage door automations to certain types of existing garage door. 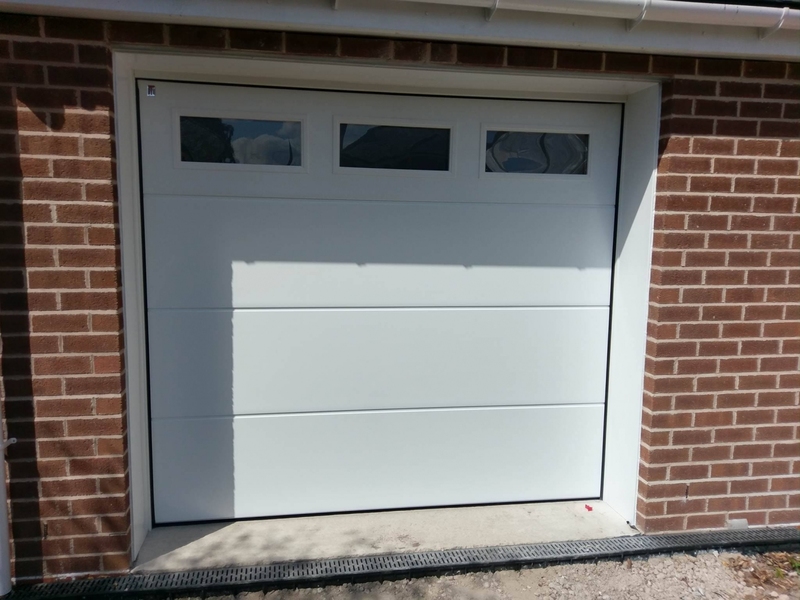 When it comes to fitting garage doors, our fitters Paul and Jason who are based in Chirk carry out the installation work, as Paul has done for us since 2013. He began his career in garage doors over 20 years ago. His experience is invaluable to Arridge Garage Doors and our customers. Before: Old unsafe broken door about to be replaced. Some local builders and developers use our discounted supply only service, with some preferring us to install as well. All retail customers enjoy our discounted prices as well. 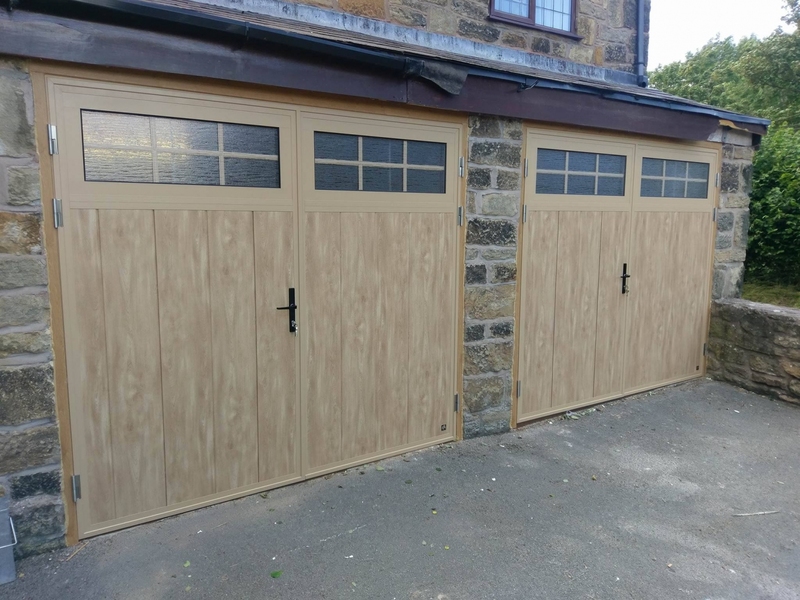 Our ranges include up and over garage doors, sectional garage doors, roller garage doors and side hinged doors, meaning you can be sure to find the perfect solution to meet your needs. Our unbeatable range of garage doors has something to offer every home. 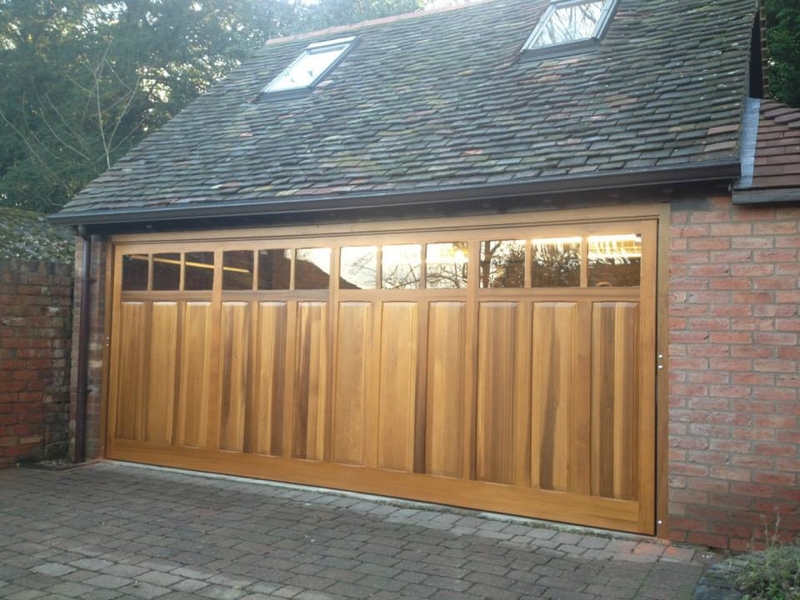 As well as all the standard options that are ideal for most homes, our range of wooden garage doors is particularly well suited to the many beautiful period homes and listed buildings scattered throughout the region. Secure, long-lasting and particularly elegant, wooden garage doors are also a popular choice for owners of prestige properties. 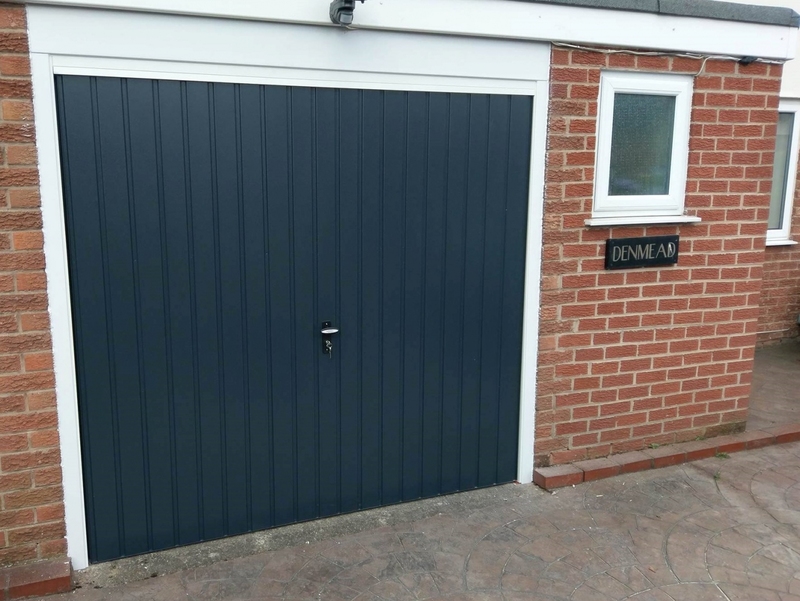 If you have converted a garage space to an alternative use such as an office, home gym or entertainment room, then our range of insulated garage doors will help you to maximise your security and comfort, as well as make the most of the available space. 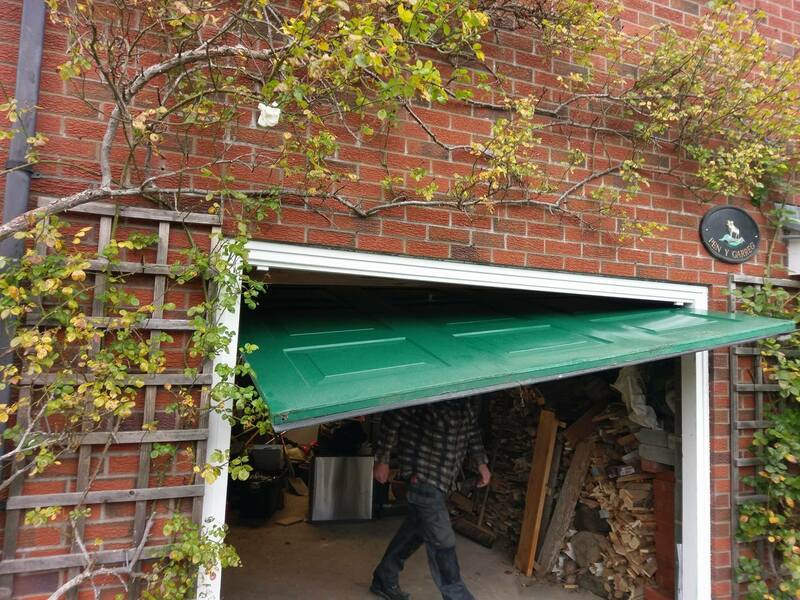 They are also perfect for garages that are used by those with a business based at home who use the garage to store items such as stock or tools. Please see our range of insulated side hinged doors ideal for heated workshops, classic car storage etc. A range of secure garage doors is also available for homeowners for whom enhanced security is a priority. These include Secured by Design accredited doors from Hormann and Garador. From your initial enquiry through to after sales support, when you buy a garage door from Arridge Garage Doors, you have the peace of mind of knowing that we are based just down the road and are always there to help you whatever questions or concerns you may have. Please see our reviews from local and national customers. For the best possible prices on garage doors, quality and service in the Wrexham area, get in touch with your local experts today. Call us on 01691 670394 and a member of the team will be happy to talk through your requirements. To help us help you better, we encourage you to complete our online Self Survey Form prior to calling, and if possible e-mail us a few photos of the aperture and inside of the garage so we can quickly and accurately advise and quote. May I just say that I have been very impressed with the help you have given me and will highly recommend yourselves in the future should anyone ask me. Excellent service from very first contact. Everyone was very professional and thorough. We are very pleased with the result. Many thanks. I would like to thank the gentleman who came to measure up. Very professional. Also, I'm extremely satisfied with the looks and fitting. Thank you. All done and what a superb job, I am very happy indeed. Thanks for all of your help. It has been a very good experience all round. Thank you for your professionalism, courtesy and efficiency in dealing with my order. I'm very pleased with the door and look forward to many years of trouble-free use, hopefully! I am writing to you for the prompt professional work carried out by the two gentlemen on Friday. My son and I are well pleased with the garage door and wish to convey our thanks for the service provided. Thanks for the great job done by your team. Very happy with the work done by the installers. Thank you for completing the fitting of the garage doors. The fitters were excellent and we are delighted with their workmanship. Thanks very much for a great job. As they said, you definitely sent the 'A' team.